The PADI Basic Scuba Diving Course is best-suited for people who are intent on learning how to dive but do not have enough time to take up a full Open Water Course. You can begin the course by reading the e-Learning materials to understand the important concepts of diving. The training materials are available online and can be accessed in the comfort of your own home. There will be in-water training and is composed of four confined water dives on the first day and two open water dives on the second. The actual diving lessons will be held at the beach of Dukes Hotel in Dubai where you can apply the theories you learned in real life. Our PADI-certified scuba divers will guide you every little step of the way to ensure your safety, boost your confidence, and encourage you to enjoy the process. No need to worry about the scuba equipment as they are included in the package. When you complete the course, you will be qualified to dive to a depth of 12m with a dive buddy. Kids (10-14 years old) who also complete the lessons can dive to a depth of 12m with a guardian or a PADI Pro. If you want to become a certified diver, you can complete the PADI Open Water Diver certification and take certain specialty diver courses. It’s very simple. After processing your payment, all you have to do is wait for the email from PADI containing a redeem code which you will use to create an account on the PADI website. Please check your inbox as the email will be sent within 24 hours. When you log into your account, you will have access to the Open Water Manual or Open Water Touch app which includes knowledge review, quizzes, video reference materials, and more. Once you’ve covered all the sections, there will be a final exam and table exam to assess if you’re ready for the water lessons. After reading the e-Learning lesson, you can proceed to the exciting portion of the course - the actual dives. Please coordinate with us so we can schedule your dives according to your preferred time and date. 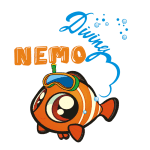 We’ll then see you at the Nemo Diving Center on your chosen date to complete some forms and to fit your scuba equipment. When you’re all set, our PADI-certified instructors will bring you to the beach of Dukes Hotel for your in-water training: four confined water dives in one session and two open water dives in the next. You must read the first 2 chapters of the e-Learning materials before starting the dive sessions. It usually takes 2 days to finish the course but it also depends on your performance - we want to be sure that you're confident enough when under water. The diving sessions don't have to be 2 consecutive days, you can take the succeeding session on a later date as long as it is within 6 months of the first one. Just let us know and we would be happy to arrange the sessions at a time that is convenient for you.